the Chadian rebels attempting to topple Chadian President Idriss Deby, and the political crisis inside Chad. We often view the crisis in eastern Chad through a Darfur lens. Consequently, conflict resolution efforts have thus far focused principally on the tensions between N’Djamena and Khartoum, but that is only part of the story. The roots of the conflict in Chad are internal, and conflict will continue in this desperate and militarized nation until Chadian opposition groups see alternatives to violent overthrow of the regime in charge. all out war. The EU and AU should reconcile the warring factions inside Chad and press for internal political reforms that will prevent future conflict. France, the United States, and China should work together to provide the necessary leverage. As in Sudan, all three nations would benefit from peace and stability, yet none individually has enough leverage to accomplish this difficult task. The United States is pursuing two important foreign policy objectives in Chad: counterterrorism and the delivery of humanitarian assistance. While humanitarian assistance is important, the U.S. needs to support conflict resolution, political reform, and social and economic development as well. 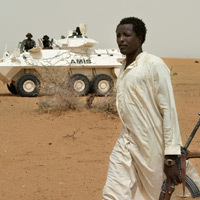 Chad receives U.S. assistance because of its importance in counter-terrorism efforts, but the U.S. is channeling most of its resources toward military training while neglecting the equally important task of addressing the social and economic circumstances that fuel internal conflict and extremist ideologies. The U.S. has influence in Chad, and President Deby has shown his commitment to the U.S.; it is up to Washington to decide if it will leverage its influence to help end the political turmoil in Chad. African Union (AU) and European Union (EU)—The EU and AU should take the lead in reconciling the warring factions inside Chad and pressing for internal political reforms that will mitigate future conflict. Meanwhile, the European Union’s deployment of a peacekeeping force to Chad and the Central African Republic has been delayed as a result of the recent violence in Chad. The European Union Peacekeeping force (EUFOR)—Authorized by the UN Security Council last year, EUFOR’s mission is to train Chadian police to protect Sudanese refugees and Chadians displaced by the violence. The mission’s credibility as a civilian protection mission hinges on its neutrality, particularly in light of the heavy involvement of the French military in EUFOR. Chadian President Idriss Deby—The President of Chad, Deby supports the deployment of a European Union peacekeeping force to Chad and the Central African Republic and his government backs some of the Sudanese rebel groups fighting in Darfur. Brokering a ceasefire: Currently, the AU has asked Libyan President Muammar al-Gaddafi and Republic of Congo President Denis Sassou-Nguesso to mediate between President Deby and the rebels. This process must include other actors—particularly the United States, EU, France, China, and the UN—in efforts to secure a ceasefire. Protecting civilians and monitoring a ceasefire: EUFOR must reach full capacity quickly to protect civilians in eastern Chad still highly vulnerable to cross-border attacks and inter-communal violence inside Chad. As deployment presses ahead, the United States, France, and China should attempt to revise EUFOR’s mandate to include monitoring an eventual ceasefire. Punitive action against Khartoum: The U.S., France and UK should work with China and Russia to introduce immediately a UN Security Council resolution authorizing targeted sanctions on senior Sudanese officials responsible for supporting the overthrow of a neighboring sovereign government, for obstructing the deployment of international protection forces in Chad and Darfur, and for continuing to promote violence in Darfur. Negotiations on serious political reform: The international community must quickly build on a ceasefire by pressing for genuine political dialogue between the Chadian government, civil society groups, and all opposition groups—armed and unarmed. The first step must address the criminalization of dissent in Chad and the recent arrests and intimidation of political opposition leaders and activists. France, the U.S., China, and the EU must also use their leverage and press Deby to resist the knee-jerk heavy-handedness that threatens to plunge Chad deeper into crisis. with other donors and the UN on initiatives to provide humanitarian assistance, relieve poverty, improve governance, and build Chadian state capacity to provide basic social services.